Tesla Motors founder Elon Musk said the need for lower-cost batteries for autos and power storage means there will need to be hundreds of “gigafactories” like the one the carmaker is planning to build. The electric-car company based in Palo Alto, California, anticipates the battery factory will reduce the cost of lithium-ion cells by more than its initial guidance of 30 percent, Musk said. He spoke yesterday at the World Energy Innovation Forum, an annual conference hosted by Tesla board member Ira Ehrenpreis. “I think we can probably do better than 30 percent,” Musk, 42, said yesterday at the company’s Fremont, California, plant. As carmakers increase demand for batteries “there’s going to need to be lots of gigafactories. Just to supply auto demand you need 200 gigafactories,” he said. 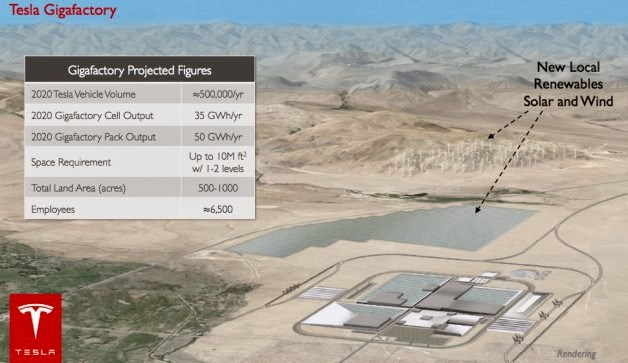 Tesla is getting close to deciding where it will build the first such proposed facility, which Musk has said will cost as much as $5 billion and involve partner companies such as Panasonic. Last week he said groundbreaking at one of at least two potential sites could happen as early as June. Along with supplying cheaper batteries for Tesla’s electric cars, the plant is to supply stationary power storage devices to SolarCity Corp., another Musk-affiliated company. Those power storage devices will also be needed by other solar power providers and to store wind power, he said, without identifying specific companies.